The Delhi High Court on Monday, 29 February has given the next date as March 2 for Kanhaiya Kumar's bail plea hearing. The court also pulled up Delhi Police for arresting without proof as the police had confirmed that Kumar wasn't seen raising anti-national slogans in any of the videos. 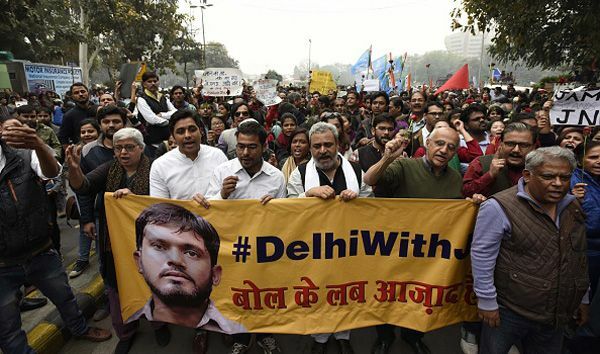 "Kanhaiya didn't raise any slogans," said Delhi Police, TV reports suggest.. In retaliation to that, the court reportedly asked the police if they "were sleeping till the TV clips were aired." "Do you know what sedition means?" the High Court asked. Police is likely to apprise the court about the ongoing probe, during which it had taken Kanhaiya into one-day custody on 25 February to confront him with two other JNU students and accused Umar Khalid and Anirban Bhattacharya. Kanhaiya was thereafter remanded back in judicial custody for two weeks on 26 February. Kanhaiya was arrested on 12 February. Umar and Anirban, who had surrendered before the police on 23 February, are currently in police custody. The students face sedition charges for allegedly raising anti-national slogans at the JNU campus during an event earlier this month.